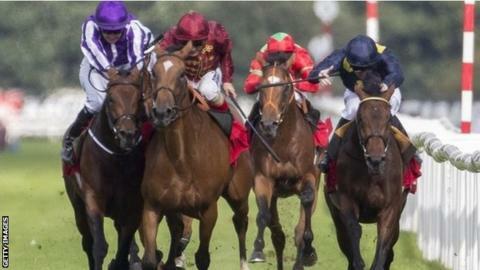 Simple Verse has been reinstated as winner of the St Leger after a successful appeal. She was the first filly to win the Doncaster race for 23 years but was demoted after a stewards' inquiry into interference during the closing stages. An appeal was heard at the British Horseracing Authority (BHA) in London. Bondi Beach, who passed the post second on 12 September, was awarded the race but is back to runner-up following the hearing. Panel chairman Tim Charlton said the cumulative effect of two incidents involving both horses had not affected Bondi Beach badly enough for him to have been awarded the race. It was the first time a horse had been disqualified from first place in the race since 1789, and Simple Verse is the first horse to win a British Classic, be disqualified from victory, and then reinstated on appeal. Simple Verse's trainer Ralph Beckett was relieved, but remained disappointed with the original decision. "It's not quite the same, and it's never going to be quite the same, in the sense of when you have it taken away on the day," said Beckett. "It was horrendous at the time and it's been a pretty miserable 11 days for those who live and work with me. It's not been much fun." Many bookmakers paid out on Simple Verse (and Bondi Beach), even though she was placed second, as they operate a 'first past the post' system. Coral says its decision to pay ante-post punters will cost the firm more than £50,000. While the outcome of the appeal may not affect punters' winnings, it could have an impact on the horses' future breeding fees, with Classic winners likely to have a higher value. A stewards' inquiry was called on the day as the two horses appeared to bump twice in the closing stages and there was only a head between them at the line. Simple Verse's jockey Andrea Atzeni and Bondi Beach's rider Colm O'Donoghue argued their respective cases in front of the stewards live on television. Both also gave evidence at the three-hour BHA hearing, with the panel deliberating for more than an hour before deciding in favour of the filly. Owners Qatar Racing, headed by Sheikh Fahad al Thani, had paid a fee of £50,000 to add Simple Verse to the race as a late supplementary entry. Prize money for first place is £393,000 while the runner-up's team receives £149,000. Atzeni won the race immediately after the Leger, on Captain Morley, but said he was in tears in the stalls. Bondi Beach's trainer Aidan O'Brien was dignified in defeat and said his horse would now head for the Melbourne Cup in Australia in November. "I am delighted for Ralph Beckett and Sheikh Fahad on his first (British) Classic win, we felt we had a fair hearing and some you win and some you lose," said the Irishman. "Colm lost a Classic, but I'm sure he will get more, life goes on - some days work for you and some against." The BHA indicated rules on jockeys causing interference could be tightened up. "If the current penalties are not achieving the desired outcome then consideration could be given to reviewing them," said a spokesman. User Friendly, ridden by George Duffield for trainer Clive Brittain, was the last filly to win the Leger in 1992. The Leger is the oldest of five British Classic races for three-year-old horses, and is the last of the season following the 2,000 Guineas, 1,000 Guineas, Derby and Oaks. "On the day I was heartbroken and was very sad. However, there are worse things in life and at least we got it back and we can move forward now. "I think I got more text messages and phone calls losing it than when I won it last year (on Kingston Hill). Those little messages can really lift you up."